The following are court results from Hastings Magistrates’ Court, which covers the Eastbourne area, for November 28 - December 2. Michael Jackson, 42, of no fixed address, pleaded guilty to assaulting a woman by beating her. The offence took place at Hastings on August 31. He also pleaded guilty to damaging reading glasses worth £200 on the same date and to being in breach of a 12- month conditional discharge, made by Brighton Magistrates on August 29 for being in breach of a restraining order. In addition, he pleaded guilty to two charges of using threatening behaviour, at Grand Parade, Eastbourne, on September 4 and to using threatening and abusive behaviour at the Royal Sussex County Hospital, Brighton, on September 23 and causing £200 damage to an external door, at Saltdean, Brighton, on September 23. He was sentenced to 10 weeks in prison, suspended for two years, and magistrates made a community order with an alcohol treatment requirement. They also ordered him to pay a total of £400 in compensation. 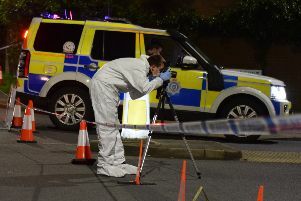 Mark Whitehorn, 46, of Hawkhurst Close, Eastbourne, pleaded guilty to failing to provide a specimen when required to do so by police under the Road Traffic Act. The offence took place at Langney Rise, Eastbourne, on October 29. He also pleaded guilty to being in possession of an offensive weapon (a wooden baton), in a public place, at Swanley Close, Eastbourne, on May 22, and driving a Vauxhall van on Swanley Close, on the same date, while unfit to drive due to drugs. The court made a community order with a three-month electronically monitored curfew between 8pm and 8am. He was also banned from driving for 28 months. Alexandros Misirlis, 18, of Port Road, Eastbourne, was found guilty of being in possession of an offensive weapon (a metal hook) in a public place. The offence took place at Langney Road, Eastbourne, on October 4. He was given a six-month conditional discharge. Adam Back, 25, of Brading Road, Brighton, pleaded guilty to driving a Vauxhall Astra on the A27 at Pevensey on October 10 with cannabis in his bloodstream. He also pleased guilty to driving with no insurance on the same date. He was fined £100 and banned from driving for one year. Evija Kepala, 34, of George Street, Hailsham, pleaded guilty to stealing fragrance and beauty products worth £491, from Boots at the Arndale Centre, Eastbourne, on November 9. She also pleaded guilty to stealing products, worth £11.50, from Holland and Barrett, in the Arndale Centre on the same date and to stealing a Philips Lumea IPL System, worth £525, from Boots, at the Arndale Centre, on September 16. The court made a community order with a requirement of 100 hours of unpaid work. Dominique Pooley, 38, of Hassocks Close, Eastbourne, pleaded guilty to driving a Volkswagen car on Saffrons Road, Eastbourne, on October 1, without due care and attention. She was fined £74 and her driving record endorsed with six penalty points. Benjamin Seddon, 29, of St Helens Road, Hastings, pleaded guilty to driving a Ford Focus on Royal Parade, Eastbourne, on November 13, while over the drink-drive limit. He gave a breath alcohol reading of 52 microgrammes. The legal limit is 35mg. He was fined £200 and banned from driving for one year. Laszlo Tornyi, 35, of Enys Road, Eastbourne, pleaded guilty to driving a Mercedes vehicle on St Anne’s Road, Eastbourne, on November 10, while more than four times over the drink-drive limit. He gave a breath alcohol reading of 142 microgrammes. The legal limit is 35mg. He also admitted being in breach of a two-year conditional discharge imposed by an earlier court for assault by beating and sending malicious communications. Magistrates adjourned sentencing to allow for pre-sentence reports to be drawn up and made an interim driving disqualification. Peter Cooksey, 53, of Rockall Avenue, Eastbourne, was found guilty of two charges of threatening behaviour and a charge of harassment. He was convicted of using threatening behaviour at Eastbourne on March 16 and April 14 and harassment, which took place between March 8 and June 22. This included verbal abuse, making threats, gesticulating, mouthing obscenities and imitating a gun firing action. He was given an 18-month conditional discharge. Magistrates also made a restraining order.